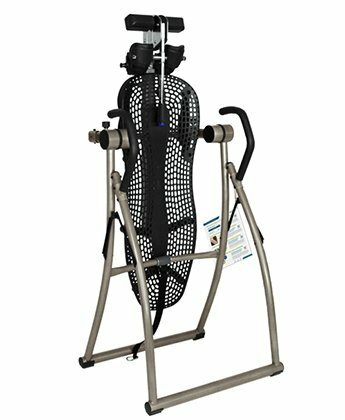 There are many inversion table brands on the market these days, and consumers have the arduous task of sorting through numerous options. With a big investment like this, it’s important to determine which type or model has the ideal features that suit you. However, it can be confusing to decide which equipment to purchase because manufacturers can just claim that their product is “safe” or “heavy-duty” even without proof. If you are simply overwhelmed by the process of choosing which brand is best for you, it makes sense to check out the most reliable names that can validate the quality of their inversion tables. And Teeter is one such brand. Teeter: The Only Brand Recognized by the FDA! 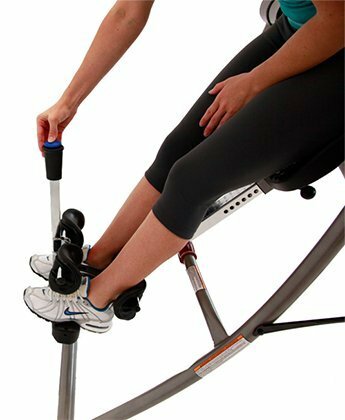 Teeter is among the biggest and most trusted brands that many inversion therapy enthusiasts recognize and swear by. It is actually the only brand that is registered with the Food and Drug Administration (FDA) as a Class I medical device. Moreover, it is UL certified, which means you are guaranteed that it is independently certified for safety and quality. Roger Teeter founded the company after inversion helped him recover from chronic back pains, a result of his career in waterskiing. Since 1981, Teeter has been continuously producing inversion equipment unrivalled for its quality. And it is currently the most enduring brand of inversion products designed for home use. With over 2 million users, Teeter is certainly a leader in the inversion market. The best of the Contour Series, the Teeter Contour L5 provides a sleek and premium inversion experience for users. The brand’s patent pivot system ensures the durability and long life span of the product. The company prides itself on the “progressive decompression” technology that enables each disc to be decompressed by the same body weight that compresses it while in the upright position. Aside from that, Teeter is the only brand in the market to be FDA-registered as a legitimate medical device. It is also independently tested and certified by UL standards. In fact, results from their published study found that a 2-minute Teeter inversion regimen done thrice a week for 30 days reduced the need for surgery by 70.5 percent! 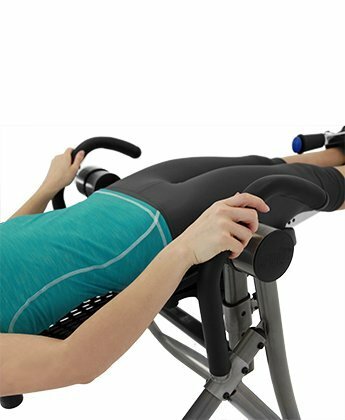 This Teeter Contour L5 is ideal for back pain sufferers and fitness enthusiasts who want to maintain a healthy body through regular inversion. This inversion table has a curved frame that is functional and aesthetically pleasing at the same time. The curve allows your legs to mount and dismount easily, while providing a secure base for the steel frame. Its Flex Technology Bed features a backrest that allows greater range of motion for stretching and working out. Compared to other inversion tables that have upholstered beds, your back will not sink into the cushion on this one. You can move more flexibly while on this table. The EZ-Angle Tether Strap allows users to pre-set angles at 20, 40, and 60 degrees depending on their needs or fitness level. With this feature, you can conveniently set the angle before you mount the device, should you choose to do so. Ergonomic embrace supports cushion the ankles to distribute weight evenly around the feet and heels. Meanwhile, the foot platform is adjustable for a wide range of foot sizes. The Teeter Contour L5 also has the Deluxe EZ-Reach Ankle System. An extra-long handle for this ankle-lock mechanism reduces the need to bend, which can be difficult to do while inverted. The handle and the gravity lock safety system are made of high-quality stainless steel for a secure inversion every time. This model has an easily adjustable one-click balance feature that gives a smooth rotation motion. Plus, you can control the angling quite easily with just one click. 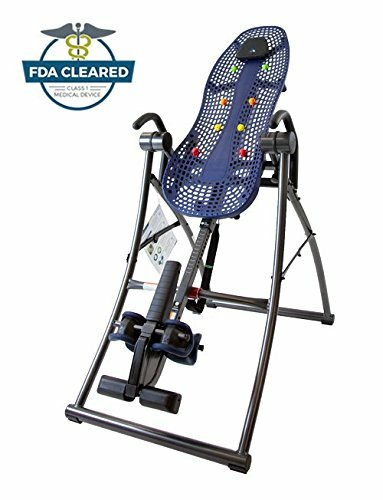 Whether you are nimble or heavier in frame, you will find it convenient to use this inversion table. The Teeter Contour L5 can accommodate weights of up to 300 lbs, and heights ranging from 4’8” to 6’6”. It is durable, stable, and easy to use even without any assistance. 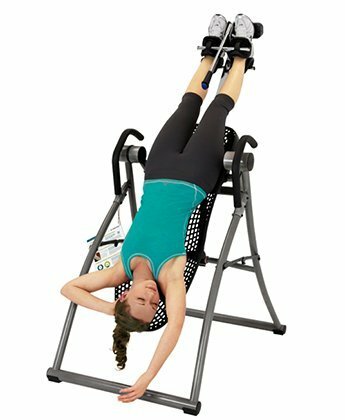 This inversion table model measures 64” W x 27.8” H x 61” D and weighs about 77 lbs. It’s relatively more compact than other units out there, great for home use. Assembling this apparatus is quite easy—in just 5 steps and less than an hour, you can complete the assembly. It helps that the parts are already 80% pre-assembled when shipped. You just have to connect the main parts together, add the handles, and you are set. Teeter provides an interactive 3D instruction guide for assembly, in case you need further help. Or, you can pay extra to have the crew assemble it for you. The Teeter Contour L5 is foldable for easy storage. You can conveniently bring it out and store it after each use. This model is covered by a full 5-year warranty. Manufactured by the same company, the Contour L5 and EP 970 have similarities and differences. One similarity is found in the ankle lock, where both inversion tables feature an extended ankle lock system where the handle is extra-long to aid in movement. Both models also have the EZ-Angle tether that pre-sets the angle to 20, 40, and 60 degrees. The difference is in the backrest. The EP 970 features a vibrating cushion that gives a massage-like sensation to the user. And it has acupressure nodes that serve as trigger points for inversion. However, it lacks the Flex Technology that the Contour L5 has, where you have a wider range of motion to stretch your spine. And the Contour L5 features one-click rotation adjustment, which the EP 970 does not have. Overall, the Contour L5 is easier to adjust than the EP 970. It’s the better unit if multiple people will be using the device. The Teeter L5 is an upgrade from the L3 unit, as it is more expensive. Actually, both have similar specifications, with the only difference between the two being their ankle lock systems. While the Contour L3 uses the ratchet lock system (also used by the EP 560 and EP 960) that fits snugly around the ankles, the Contour L5 uses a gravity lock system that functions via a longer lever. This makes the L5 easier to operate without the need to bend at the waist. It is up to you to decide whether this comfort feature is worth the extra cost. 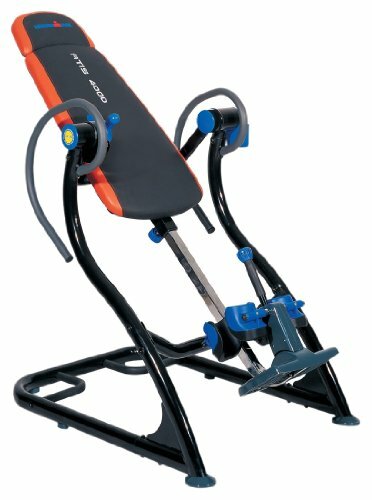 Picking the best inversion table depends on many things, and for us, it really depends on what your expectations are. These two well-known units, for instance, each have their own merits that the other one does not have. The Ironman ATIS 4000 is famous for its “smart gear” device that enables you to lock at 10 different angles. By locking while in the inverted position, you can perform intense ab exercises while inverting. Plus, it provides a higher degree of stability with its 2-inch tubular steel base. The Teeter Contour L5 may not have the locked angle gear, but it does have the flexible backrest that allows for a greater range of motion. With the backrest holes, you can fit acupressure nodes and add muscle stimulation as you invert. The Contour L5 is also easier to store than the ATIS 4000. Again, it depends on you what type of inversion table you believe suits your needs. Teeter is the longest-established manufacturer of inversion products worldwide, and for good reason. They offer high-quality inversion tables that are known for strength and durability, functionality, and user-friendliness. Plus, Teeter tables are the only FDA-registered inversion tables in the market, which gives the brand total credibility as far as addressing back problems is concerned. 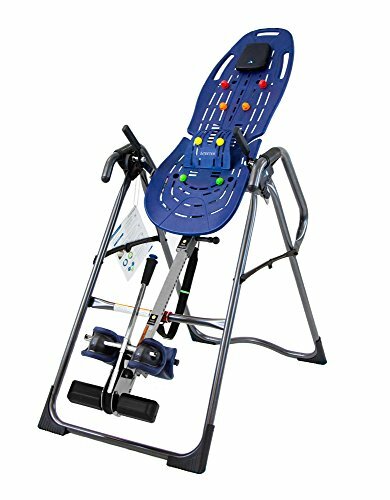 If you are looking for a convenient and stable inversion table that can give you the benefits that inversion therapy provides, then opt for the Teeter Contour L5. With its one-touch rotation adjustment, you can control pivot changes effortlessly. It has a secure ankle lock system that ensures both safety and comfort as you invert. This equipment can truly benefit all members of your household. It is easily adjustable, it can support the user whatever their weight and height, and it can be positioned at various angles. If you want 60 degrees, but your partner chooses a beginner’s 30-degree incline, it can all be done. And you can add acupressure to your inversion with the backrest nodes. The best part about this is the 5-year warranty, longer than most inversion table models cover. With Teeter, you get a premium product that can last for years.